As a small business owner and espresso bar operator I found the Barista training excellent. 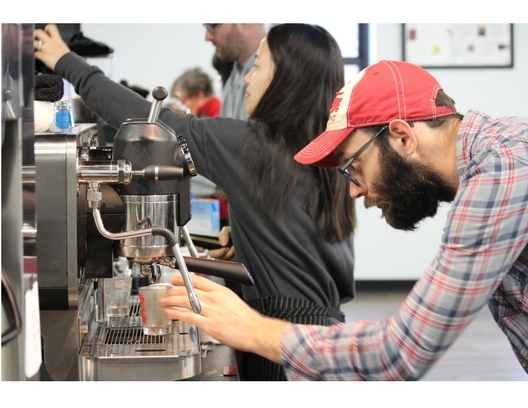 in addition to Hands-On practice and instruction on the art of high-quality espresso drinks, there was also plenty to be gleaned about the science of espresso. Overall a well-balanced, excellent course. Before taking the Royal Coffee New York barista class, we had no idea how to talk about espresso or espresso-based drinks. Now we can have intelligent conversations about where and how we want to develop the brewing side of our roasting business. Ana is so knowledgeable and experienced yet she is warm, helpful and encouraging. She was able to meet each student where they are since some had more experience or varying goals. All attendees learned a lot and got very good value in the class. I highly recommend Ana to anyone looking to bolster their knowledge in specialty coffee. - Janet F.
Being a well versed barista takes a lot of practice, but building a strong foundation in the basic skills you need will help make the learning curve less steep and have you mastering a busy rush hour behind the bar in no time! Students will have plenty of hands on time on the machines dialing in different coffees as espresso, steaming milk, and making lots of drinks. Although this class is a focus on the foundations, students will leave feeling proficient and comfortable working behind the bar at a busy cafe. We’ll have a practical “exam” at the end of the course for students to see how far they’ve come in just 2 days, and in what areas they need to focus on going forward. The price of the 2 day course is $400. Lunch is included for both days.